Submitted by Stefan Drissen on Monday, May 14, 2018 - 21:32. Play all those funky Amiga (four channel) MODs on your blue footed friend. Either via the SAA1099 soundchip (3 bits per channel, stereo), the Search: “Blue Alpha sampler” (6 bits per channel, mono), the SAMDAC (7 bits per channel, stereo) or the Quazar Surround (8 bits per channel, surround). Watch the hex scroll by as the music plays. MODs are short for Modules, and these spritely things first came about on the Amiga, followed by the PC (where the MOD evolved somewhat). These Modules are files consisting of samples and music data on how the samples should be played. 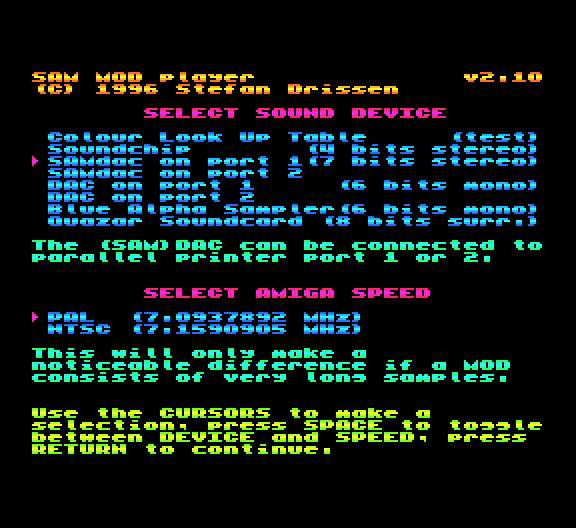 PC Modules are available on Public Domain, while SAM MODs (Amiga converted, mostly) are available courtesy of Fred Magazine. But hang on. Why shell out £5 on a MOD player when you get one in Fred 40 for £2? (Oh, along with some programs and a mag). Well, anyone who has been down to some of the more recent Gloucester show s couldn’t help but notice a tall programmer running around with a necklace of SAMDAC s trying to flog these handy pieces of hardware. Lo! For this man is no mere mortal. For he is Stefan Drissen , programming genius from a land far, far away (The Netherlands). He programmed the first MOD Player as mentioned in Fred 40, though compared to this new MOD Player of his, the Fred one seems less than functional! From the start, you know that you’re being treated to a fabby piece of kit. The on-disk manual is full of information and hot-keys aplenty, and when you load up the actual MOD Player, you are simply spoilt for choice. For a start, you get to choose from a myriad of playing devices, including the SAMDAC (ah, you see why he’s been carrying around that hardware necklace! ), the Quazar Surround , the Search: “Blue Alpha Sound Sampler” and even the humble SAM SAA1099 Phillips soundchip. Actually, I heard the SAMDAC play some MODs on the Fred stall at the October Gloucester show, and they sounded incredibly tasty indeed. The hard graft is that the more bits your sound device has, the better the quality of the MOD being played on this sound device. I had the fun of my humble SAM soundchip, but even this was good enough for me. Modules are best played through a Hi-Fi speaker system, although TV speakers are just about bearable with the Soundchip (the basic set-up for the basic SAMster!). The MOD player then allows you to choose if you want your MOD to be played in NTSC mode or PAL mode. It may sound technical, but there really isn’t all that much difference - the NTSC mode relates to the American Amiga and is 1% faster than the PAL English Amiga. Then you’re treated to the MOD Player’s impressive disk-manner. 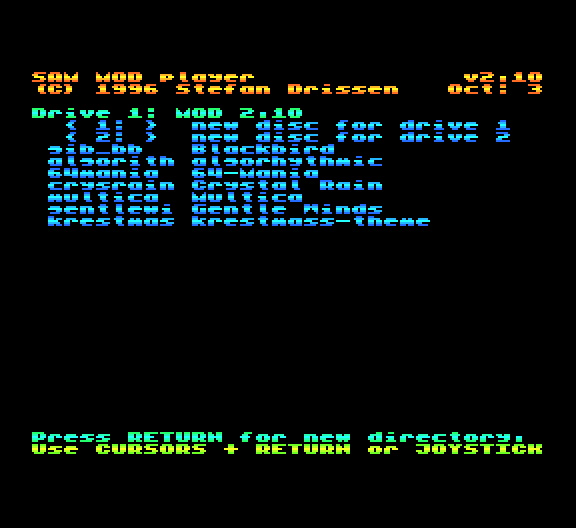 There are 5 Modules on the MOD Player disk given generously with the player, and each one is a different example of what can be heard. I say that this is impressive, as it’s more user friendly than the Fred MOD Player, displays the MOD’s title, creation date, no of samples, file size, etc. It also gives you the choice of loading in a 5 or 3 octave MOD. On the Player, there is one 5 Octave MOD out of the 5 given, which simply allows for easier octave swings. This gives you some nice quality MODs to listen to. Not only that, but the Player can actually load PC MODs from PC disk! Hurrah!! Saying this, a huge amount of Public Domain MOD material becomes instantly accessable (although understandably, MODs of a length larger than what can be squeezed in aren’t displayed). Once your MOD is loaded in, playing with it is great! You can listen all the way through the MOD, but there is some other fun stuff. The function keys give you various screens, including one where you can see some hidden messages not previously seen on the Fred MOD player (erm, including a friendly one about breaking hackers’ legs…), as well as a techy page and also the main viewing screen. You can tell it is this, because the screen has 4 columns corresponding to the 4 channels of the MOD. 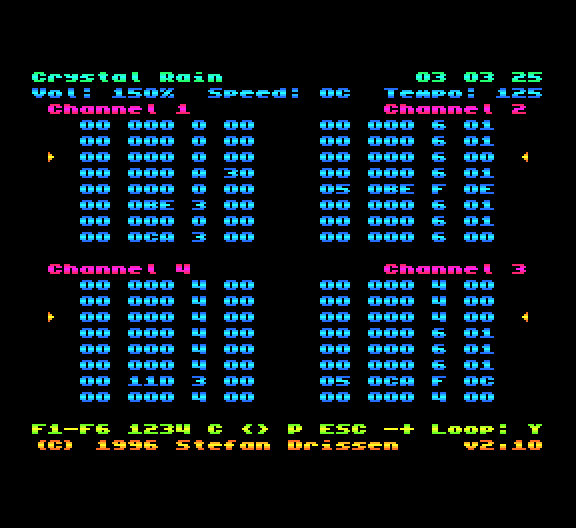 Each channel has a yellow arrow which runs down along with an ever-changing list of hex address and the like - very advantageous to the advanced programmer. You can fast forward or rewind through your MOD with the press of an F9 key, pause the MOD and make it loop. Though the most intresting feature is the ability to toggle any of the 4 channels on or off, with the help of the number keys. Another screen has an effects summary for all the MOD effects possible, and there’s even an instrument screen to show you what is being played - yellow arrows showing you what’s what. Stefan was helped through the MOD Player with Edwin Blink (who also helped with the SAMDAC’s creation!) 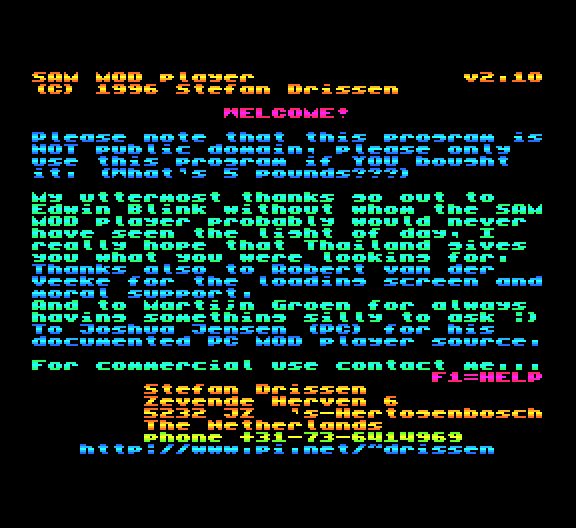 and Robert Van Der Veeke (big graphics bloke who did the fabby Manga-esque loading screen), and this has to be Mr. Drissen’s best thing he’s ever done. Using the MOD Player is great fun, and I was digging up back issues of Fred and loading up MOD after MOD of musical fun. The 5 MODs given with the MOD Player are ideal for showing what can be done, and there’s one or two real corkers in there too. Though the real reason for purchasing this corker of a utility is the PC edge - the fact that tons of stuff is now accessible to the “humble” SAM. I can imagine the looks of surprise from those (ever increasing number of) PC owners who see their MODs being played on our blue-footed mate. But not only that - they’ll wow in amazement at this excellent utility.